Perennial herb from a short, thick stem-base with fibrous roots; stems erect, 5-40 cm tall; plants smooth, fleshy. Basal leaves waxy green, the blades oblong egg-shaped to circular or kidney-shaped, 2-12 cm long, margins wavy coarse-toothed, round-toothed, or nearly entire; long-stalked (2-25 cm). Inflorescence a 1- or 2- (4-) flowered, terminal cyme, the flowers 2-4 cm wide; flower stalks erect, usually leafless or with 1 leaf; petals absent; sepals 6 to 12, white or greenish, tinged bluish on outside, oblong, 8.5-23 mm long; stamens 50 or more. Follicles, 4 to 15, spreading, linear-oblong, 10-20 mm long, 3-4.5 mm wide; beaks straight or curved, 0.5-1.8 mm long; seeds brown, elliptic, 1.9-2.5 mm long, surface longitudinally wrinkled or grooved. Wet to moist meadows, bogs, fens, streambanks and seepage sites from the lowland to alpine zones; common in W BC, west of the Coast-Cascade Mountains (var. biflora), frequent throughout BC except Queen Charlotte Islands and adjacent coast (var. leptosepala); N to SW AK and S YK, E to AB and S to NM, AZ and CA. 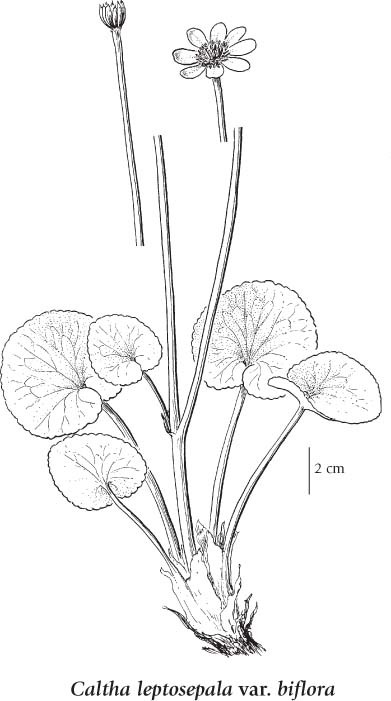 Caltha leptosepala subsp. howellii (Huth) P.G. Sm.